The Islanders practiced with a fuller roster Sunday afternoon, as Olympians Michael Grabner and Thomas Vanek rejoined the team on Long Island. Grabner and Vanek led Team Austria to their first Olympic win in 12 years, a 3-1 victory over Team Norway on Feb. 16. Grabner was one of the breakout stars of the Sochi games, scoring five goals and tying Phil Kessel for the tournament goal-scoring lead, despite playing two fewer games. “It was really good," Grabner said. "It was a great experience over there. The facilities were good, the housing was good. It was a good experience overall. The Austrian speedster scored a hat trick in his Olympic debut, burying three goals on Finnish netminder – and Boston Bruins star – Tuukka Rask. Grabner had another three-point effort (two goals, one assist) against Norway, finishing as the tournament’s fifth-leading scorer, despite playing at least one fewer game than the next 25 scoring leaders. Grabner said he hopes that his hot hands carry over when the Islanders resume their schedule on Thursday against Toronto. Vanek also had a positive experience at the Sochi games, finishing with one assist in four games as the Austrian captain. Both players had a chance to talk to captain John Tavares after a knee injury forced him out of competition and the rest of the NHL season. 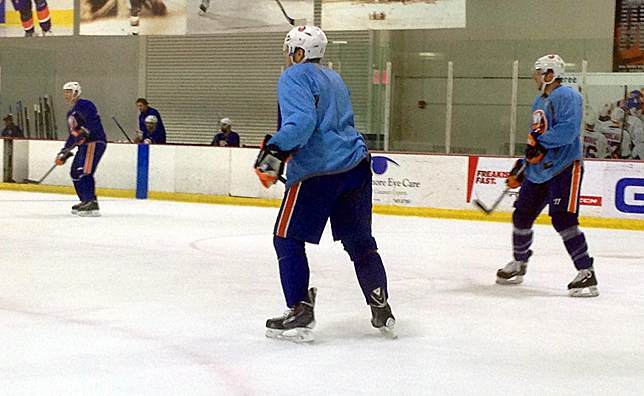 Frans Nielsen was placed on the Islanders injured reserve after Sunday’s practice. Nielsen suffered a broken hand against the Colorado Avalanche on Feb. 8. The Danish center skated with Islanders coaches and Matt Martin this week and participated in another skate today on the small rink at Islanders Iceworks. 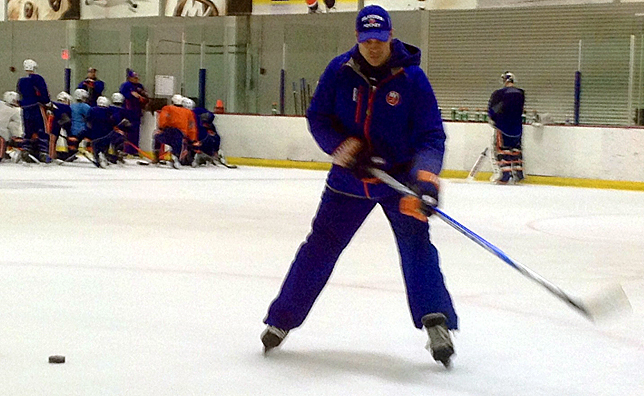 Islanders Assistant Coach Doug Weight returned to practice after spending last week coaching the Jr. Islanders at the 2014 Quebec International PeeWee Hockey Tournament in Quebec City. Weight, along with Islanders Assistant Coach Matt Bertani and Skill Development Coach Bernie Cassel, coached the Jr. Islanders to a 5-3 record at the prestigious tournament. Weight’s son, Danny, was one of the top scorers in the tournament, notching six points in the Isles first two playoff games. The Jr. Isles bowed out of the tournament in the third round of the playoffs after losing to the Antoine Girouard Gaulois on Thursday night. Weight had high praise for the event, as well as Quebec City, which he said passionately supported the youth hockey event. The Jr. Isles coach estimated that as many as 700 people took in their playoff game against the Philadelphia Jr. Flyers and that as many as 6,000 people watched the finals at the Colisee.